And this Thing I saw! How can I describe it? A monstrous tripod, higher than many houses, striding over the young pine trees, and smashing them aside in its career; a walking engine of glittering metal, striding now across the heather; articulate ropes of steel dangling from it, and the clattering tumult of its passage mingling with the riot of the thunder. A flash, and it came out vividly, heeling over one way with two feet in the air, to vanish and reappear almost instantly as it seemed, with the next flash, a hundred yards nearer. 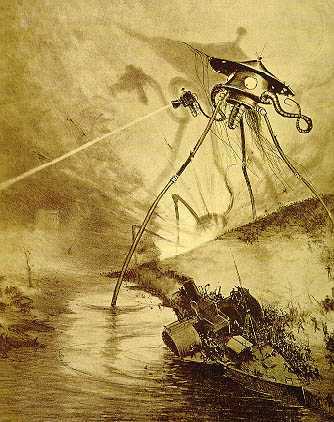 The War of the Worlds (1898) H.G. Wells. The war machines described by H.G. Wells were a vivid foretelling of the tanks that would eventually appear on the real battlefields of the Somme. They also present an interesting biomechanical problem- how can a tripod walk? Why should a tripod walk? A tripod in the simplest stable supported structure. It is also the only supported structure that is still stable if the legs are of uneven length. Walking is the best way of moving over different types of terrain, especially rough terrain. So, in theory, a walking tripod would be a very useful thing. But in practice this is not so. As soon as a tripod lifts a leg to take a step it becomes a distinctly unstable bipod. It is probably significant that no known living creature has ever walked the Earth on three legs. This contributes to the 'aliennes' of the war machines in The War of the Worlds . The problem has now been solved by researchers at the RoMeLa laboratories in the United States. Their gait uses the the same leg to both push off and advance. This solves the stability problem because the tripod 'falls' in the direction if the walk. They have built an experimental robot called the Self-excited Tripedal Dynamic Experimental Robot (STriDER) to test this gait. Interestingly, for this to work, the body needs to flip over which is probably not something a biological creature would do. So, will I ever have one of these in my house pushing the vacuum cleaner? Unlikely. The research is being paid for by the military. The RoMeLa video describes the robot carrying Cameras, for surveillance of antenna for communication. If it can carry a camera, it can carry a gun.